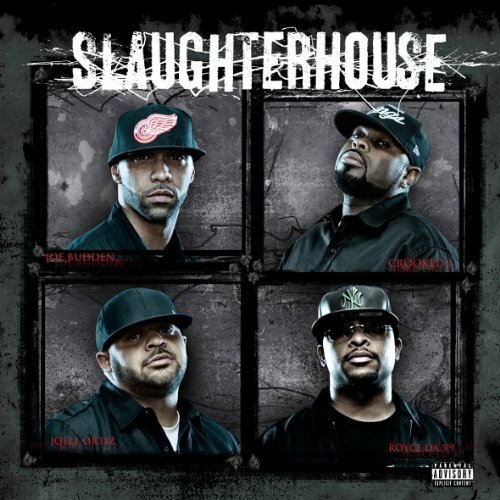 Hip Hop has never seen a more harmonious and dynamic underground group like that of Slaughterhouse. With the perfect style, flow and rhymes, Slaughterhouse defines the term “Underground Elite.” Embodying the very truth of Hip Hop and all that it encompasses, Slaughterhouse has tuned their path of success on the most underrated talent in the industry. From the first track (“Sound Off”) to the last track (“Killaz”), the talent of Joell Ortiz and Joe Budden is evident. Crooked I and Royce Da 5’9, illuminate the tracks with their tone and ability to story tell, as their words on “Rain Drops” (featuring Novel), are deep in reflection and chilling in truth. Their first single “The One,” was a great business move, as that track is the ice-breaker they need to get that much deserved air play. Although Slaughterhouse grinds and strives on the roots of Hip Hop, they have the greatest sense of humor I’ve seen in a Hip Hop group. Joe’s ability to not take himself too serious is an ultimate plus to the group, as their audience can definitely credit them for character and personality. The skit, “In the Mind of Madness,” gives a playful look into the ever over-working mind of Joe Budden; needless to say that it’s hilarious! Slaughterhouse will never stand in the category of “mainstream” and that is something I truly appreciate. Finally, an album for real Hip Hop heads! Keep a look out for their individual albums in the next year.